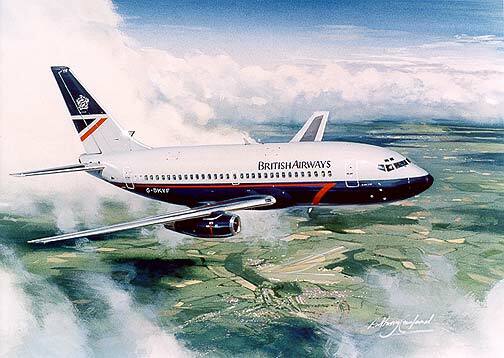 A British Airways 737-236 holds over the south east of London. A British Airways 737-236 holds over the south east of London. With Biggin Hill Airfield clearly visible in the distance, holding in the stack is part of life landing at London’s busy airports. Powered by two Pratt and Whitney JT8D engines the Boeing 737 has been the backbone of the European fleet. Bought to replace the ageing Trident fleet the 737-236 has now been replaced by more up to date versions of the 737 as well as the Airbus. This fine art print by the artist Anthony Cowland G.Av.A. is a limited edition of just 250.